Komodo National Park was established in 1980. Initially the main purpose of the Park was to conserve the unique Komodo Dragon and its habitat. The world's largest living lizard can grow over 3 metres and can weigh between 70-150 kilograms. The Komodo Dragons are carnivores with a fearsome reputation, capable of knocking a full grown adult to the ground and injecting toxic saliva into its victims with every bite. However, over the years, the goals for the Park have expanded to protecting its entire biodiversity, both terrestrial and marine. In 1986, the Park was declared a World Heritage Site by UNESCO and later, a Man and Biosphere Reserve. Under the water, the Park has one of the richest marine environments including coral reefs, mangroves, seagrass beds, seamounts, and semi-enclosed bays. These habitats harbour more than 1,000 species of fish, some 260 species of reef-building coral, and 70 species of sponges. Dugong, sharks, manta rays, at least 14 species of whales, dolphins, and sea turtles also make Komodo National Park their home. Komodo National Park, the "Land That Time Forgot", was voted one of the New 7 Wonders of Nature in November 2011. Komodo National Park is located in the centre of the Indonesian archipelago, between the islands of Sumbawa and Flores in the Lesser Sunda Islands. Roughly 200 nautical miles east of Bali, it includes three major islands: Komodo, Rinca and Padar, as well as some eighty smaller islands creating a total surface area (marine and land) of 1,817 kilometres. The islands of Komodo National Park are volcanic in origin surrounded by fringing and patch coral reefs. The terrain is rugged and dry, consisting of barren sun scorched rolling hills and savannah vegetation with very few trees. Komodo is one of the driest regions of Indonesia. The picturesque beaches of Komodo are mostly deserted with a background of rocks and hills. Pink Beach on Komodo Island is famous for its beautiful pink sand, formed by a mixture of sand from white calcium carbonate and the bright red skeletons of organ pipe corals which do not lose their pigments when they die. The main gateway to Komodo is from the small fishing town of Labuan Bajo on the western tip of the island of Flores. Flights depart daily from Denpasar and the journey takes1.5 hours. 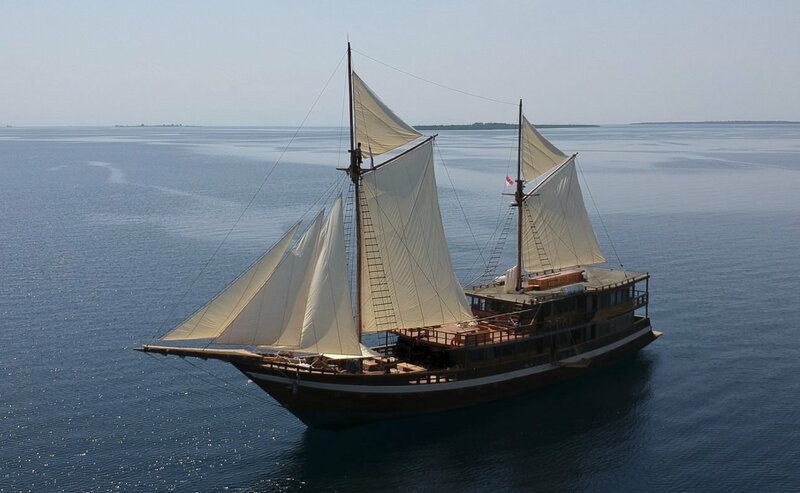 Some liveaboards also cruise from Bali to Komodo and vice versa. Exploring one of the last underwater frontiers on scuba is the main reason visitors come to Komodo National Park along with the opportunity to see the famous Komodo Dragons in their natural habitat. During your trek to spot the Komodo Dragon you may also come across the Timor Rusa Deer (the main prey of the Komodo dragon), horses, wild boar, water buffalo and the mischievous crab eating macaque. Other activities include beach hopping, snorkeling, kayaking and hiking. Every evening thousands of giant fruit bats with a wing span of over 3 feet (the largest in the world) flock from Kalong (Bat) Island at dusk - a truly spectacular and memorable scene as you watch the sunset over the glowing sea. Komodo has a hot and humid climate all year round, characterised by a wet and dry season. It is, however, one of the driest regions of Indonesia. The Southeast Monsoon (dry season) is from May to October, whilst the Northwest Monsoon (wet season) runs from December to March. April and November are transition months. The wettest months are January and February. The day time temperature averages around 30°C, sometimes reaching as high as 40°C, whilst overnight lows can drop to 21°C. Humidity is at its lowest during the dry season. Komodo can be dived on a year round basis. The best diving in the North is during the Southeast Monsoon (May – October). Visibility is good in the North year round and the water temperature in the North is generally higher than in the South. Water temperature is highest in the North during the dry season. The best diving in the South is during the Northwest Monsoon (December – March) when visibility will be better. During the dry season in the South, the visibility is lower due to oceanic up-welling and increased plankton. However, this also makes the area richer in marine life during this time. Water temperature is highest in the South during the wet season. The water temperature around Komodo ranges from 23°C to 30°C. There are over 50 dive sites in the area, some of which fall outside of the scope of the Komodo National Park. Indonesia has more species of fish and corals than any other region in the world and the Komodo archipelago is one of the richest marine environments in Indonesia. The constant tidal flow through this area combined with upwellings of cold, nutrient rich water has lead to two very different marine environments. 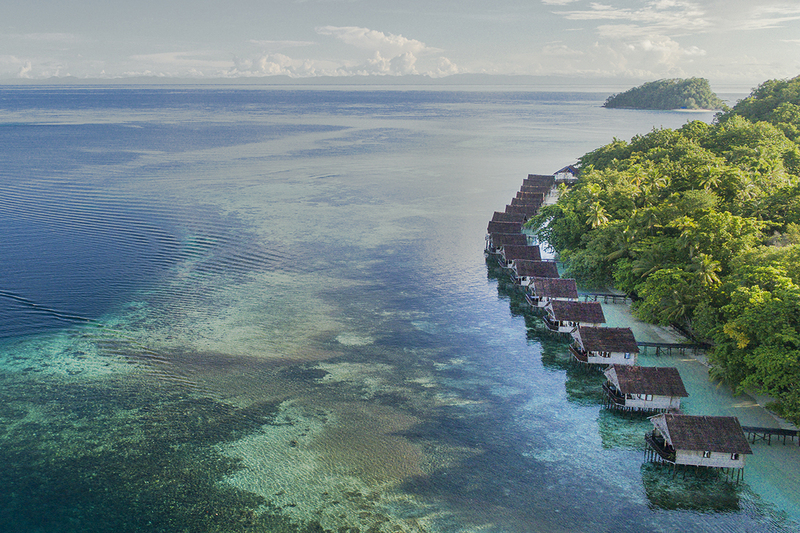 In the North of Komodo, warm water flows from the Banda Sea providing clearer tropical waters and pristine hard corals. To the south, cooler water flows from the Indian Ocean and deep water up-wellings bring masses of plankton providing nutrient rich waters to feed soft coral polyps, other invertebrates, reef fish and Manta Rays. Visibility changes quite dramatically the further south you head as does the water temperature with an average of 28 degrees Celsius in the north and 23 degrees Celsius in the South. Whilst diving in Komodo does come with it’s challenges (the waters surrounding the islands are current prone and surrounded by turbulent eddies) you will be rewarded by exciting diving on reefs exploding with marine life and colour. Dive sites vary from rock pinnacles and walls with dense coverage of soft and hard corals and sponges and fish life so prolific you may have trouble seeing the reef, to fringing reefs, sea mounts and channels where you can find some amazing and unusual critters. Manta rays also frequent the area feeding on the plankton rich waters. 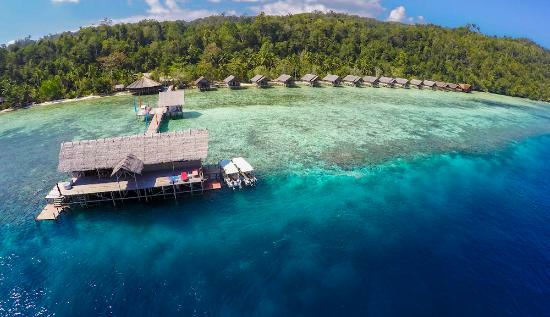 Komodo is suitable for experienced, advanced divers looking for a challenging diversity of diving featuring both pelagics and macro dives, pretty coral reefs as well as heart pounding and adrenalin inducing drift and current dives. A very colourful dive with excellent soft coral coverage. Clouds of anthias and schools of yellow-ribbon sweetlips are always encountered while frogfish, moray eels and scorpionfish are commonly seen. There is a small mound northwest of the rock where different species of fish school seasonally including tuna, mackerel, giant trevally and blue fin trevally. The top of the reef is covered in colourful corals, invertebrate life and thousands of brilliant reef fish. Along the steep walls in deeper water many larger fish including sharks, napoleon wrasse, giant trevally, dogtooth tuna, and large schools of rainbow runners can be observed on almost every occasion. Rich soft corals abound as well as sea apples and other sea cucumber species. Amongst many surprises are flamboyantly coloured nudibranchs, and fire urchins with Coleman shrimp. The fish life can also be quite good with an array of scorpion fishes, schools of red snappers and surgeon fishes. Pygmy seahorses and frogfish may also be seen. The reef slope is very rich in marine life and the sandy bottom at 15m depth is covered in garden eels. On the approach to the channel, turtles may be seen as well as a school of giant sweetlips that live in a grotto near the surface of the water. Around the southwest corner of the island, the shallow reefs are extremely rich and full of fish life. Bumphead parrotfish are commonly seen and aggregate here to spawn annually around the month of April. Sharks and schools of batfish also reside in the passage. A large coral head about two thirds of the way through the dive teems with life and activity. This area is marked with very large giant trevally, sharks and a high diversity of other invertebrate life in relatively shallow water between 5-20m depth. Manta rays are regularly sighted at the cleaning stations often lined up in the current. Komodo is a perfect destination for liveaboard diving, enabling you to dive the best dive sites around Komodo all in the one trip as you cruise from island to island around the National Park. As many of the dives are drift dives and need to be dived during optimal tide times, diving is done from tender boats.